Recap: Yesterday I left the ranch feeling great about how we had ended things- we did our little arena work, nice short trail ride, and worked past the scary tractor. We ended with Cello almost lying down. We had a good warm up in the arena, trotting nice and forward with a little canter. 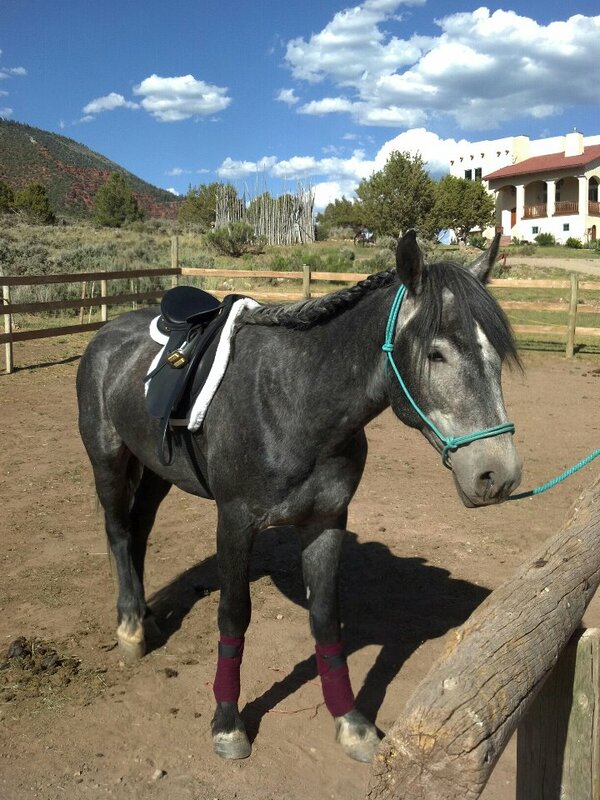 I decided to head out to the trail after that, planning on cantering more/working out of the ring. It didn’t seem like the arena was his favorite place, though he was behaving and willing. Cello is just so adorable all perked up on the trails. We made it about 1/8 of a mile down the path along the pastures, when he became a little nervous about a spot where some farm equipment was stored. He stopped. I asked him to go forward. He said no. I said yes. No. Yes. No. His compromise was to go backwards whenever I nudged him forward, and to stand still if there wasn’t a cue!! We discussed it and discussed it (I don’t say argue or fought, because this horse does not act up enough to do either.) It was a moot point, and since up until that moment everything had gone well without extras I didn’t have spurs on or a whip handy. More about that later. So I hopped off him, and let him see that the equipment wasn’t scary. He agreed with me from the ground, walked up and checked everything out, but even with me leading wouldn’t walk past it. Again with the backing up. I am beginning to grow a little frustrated. I definitely need those extra tools- I’m not going to get into a disagreement I can’t win, especially with a horse that is from the wild and needs dominance established. They are back in the barn. I pulled a trick out of one of my old trainers book, and decided that if he thinks backing up is great, we will back up- and back up, and back up, and back up, the whole 1/8 mile, back to the tools. If that’s what he wants to do, we can do it, but on my terms. My trainer used to do this on occasion with horses that wanted things their way, until they realized it wasn’t their way anymore or fun. It usually resolved the issue, as long as it was not used repetitively and became an escape route. I am conscious of that and get to that point later as well. So we get to the arena, and after backing so long he decides moving forward might not be so bad. For a few minutes. He splays his little feet and plants them. I calmly go select a whip from the stable- there was an ideal one waiting for me, about doubling the length of my arm, with a short tassle and VERY flexible end. I use the whip for communicating, not beating, for any non-horse people reading this. The flexible end is great because you can lay the whip on the part of the horse you want to reach and VIBRATE it, not smack. It is an extension of your arm. Also, with some odd foresight I had brought out my English spurs (again, non-horse people, they are mild and not the spurs you think of in Western movies). We do some in-hand work and broke the standing-still stand-off. We move forward nicely and freely. I hop on- at first a little bit more of a discussion, but with a little vibrating encouragement and only one solid nudge, we are off! Off at a nice walk, with a relaxed neck and over-step. Such a simple change after probably a 1/2 hour discussion on whether or not to move as asked. We move up from our walk to a great, honest trot- success! Power steering, listening ears, relaxed strides. After a few rounds of this in each direction, I hop off and give him over the top praise. He did what I wanted so the pressure backed off and he was rewarded. I unsaddle him and we worked on the lunge line for a few minutes- stop and forward, forward and up, transition down until he is just listening to my voice only. At first I had the whip behind his hindquarters softly encouraging him, but it was unnecessary after the first few circles. At the end of this we had lots of licking and chewing and other submission signs. I felt like I could breath easy- I admit, for a few minutes, I entirely felt how rusty I was and doubted myself. But Cello and I were able to meet each other and communicate on a mutual level. It helped to be at such a low pressure facility, where people weren’t watching and triggering an anxiety attack. I had time to think sensibly and work quietly and calmly with Cello, instead of feeling pressure to get things right ASAP for a crowd of gawkers. We worked into what we were attempting without force- there was no need to use the spurs after one nudge, and there was little need to vibrate the whip on his hindquarters after we loosened up. I encouraged and asked, encouraged and asked until he gave in. No strong hand.We ended with him listening to my verbal cues, doing what I asked simply because I asked. Today was the first day we had a little training session. The other two days were so mellow and calm. Tomorrow we will start out lunging, then arena work, and then we will go on a trail ride and move FORWARD past our scary spot, no stopping or backing, no questions asked. If I had more time today we would have left the arena again, but I was a little short and we ended on a good note. I think we both have a lot to learn about how to communicate with the other. 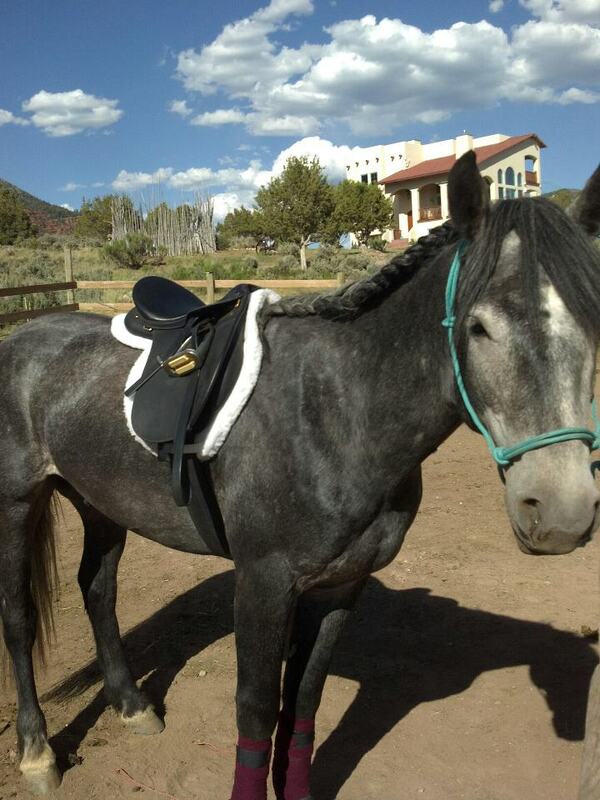 Just to reiterate, Cello is my first BLM mustang, and he was trained Western. I do worry a bit about crossed wires, but we seem to be on the same page most of the time, working towards being on the same paragraph. Hopefully by this time next week Cello and I will be reading the same sentence at the same time! Spencer commented after that we both looked good, especially on our last spin around the ring and longing. He kept an eye on me and Cello from a distance while he was dragging a pasture. No pressure there. Cello and I ended the day with a long grooming and a massage from tail to ears. I found his sweet spot, on his left side just above his brand. I didn’t feel the great feeling I had when I left the ranch yesterday, but I was satisfied with how the situation played out. I am looking forward to tomorrow and working down the trail. Again, no stopping or backing. I’ll be going prepared and won’t offer an escape route that isn’t forward. This is just a testing phase, so I’m not worried. The last two days we had side-passes and did other things like opening and closing gates, so I know we aren’t at total odds cue wise. Our first arena ride today went nice as well, I keep forgetting and re-thinking the latter. We were a lot more precise. It was only after the trail things got rough. Cello is out with the main herd with no issues. Pretty Jazzy moved today to her new barn where I think her owners will have a lot more success- the ranch we are at wasn’t really conducive to her situation. I wish that flashy girl all the best! 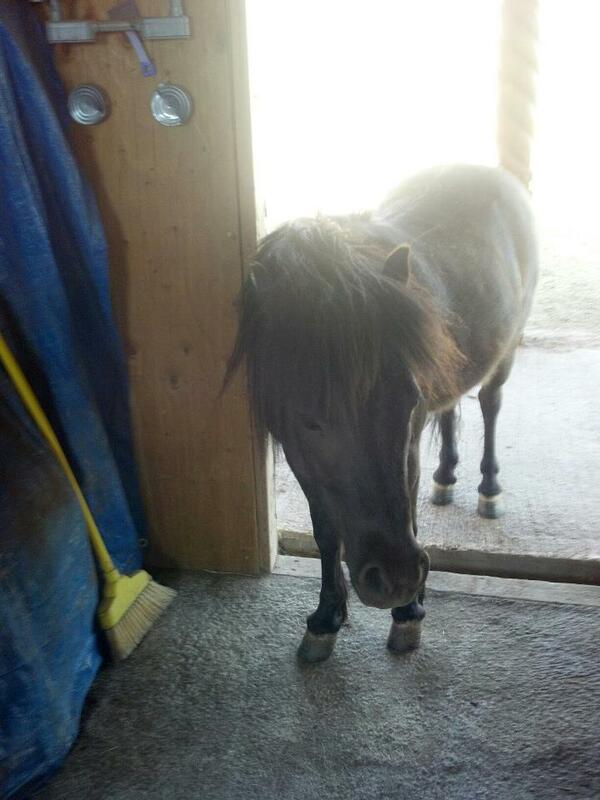 I will leave you with a picture of Studley the mini- he felt I needed help getting my tack and hung out in the barn with me some. Pictures of Toast the mini-donkey (Cello’s BFF) and Fuzzernuts the cat also to come. P.S. On the joking side, it’s entirely possible that Cello acted up because I brought him carrots. Yes, this horse despises organic carrots. When I tricked him into taking one he gnawed it once, looked at me with reproachful eyes and spat it out. Not happy. I promised him tonight I would never bring him carrots again! 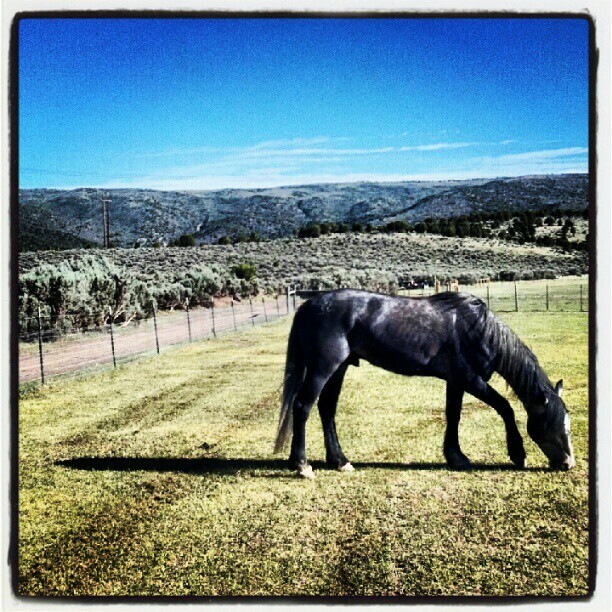 This entry was posted in Training Philosophy, Trust and tagged BLM, Cello, Dani Neumann, Emilee Shearer, Extreme Mustang Makeover, Goodboy, horse training, Mustang. Bookmark the permalink.